I have become slightly obsessed with my slow cooker and have been searching for different recipes to make. 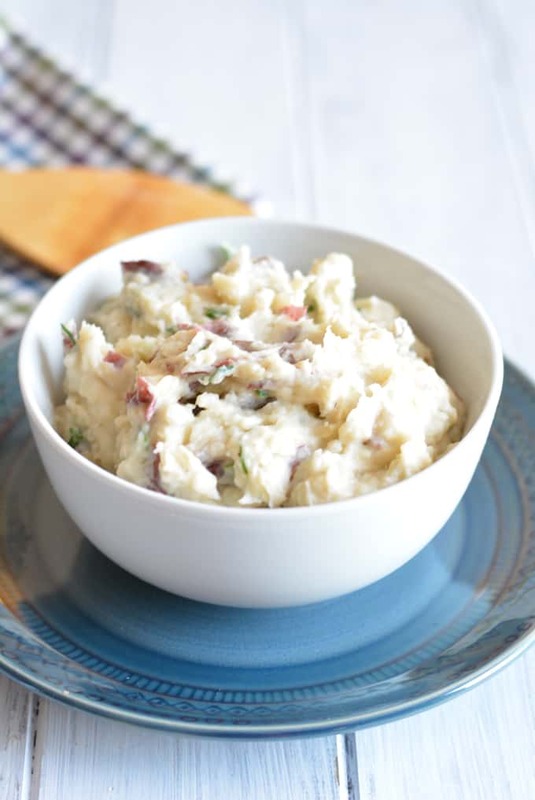 Slow cooker mashed potatoes will definitely save room on the stove this Thanksgiving! I have had my slow cooker since I was married 16 years ago. In my Chicken Noodle Soup post, I talked about how I rarely use the machine. With our busy schedule, we tend to eat dinner late. My hubby now works from home, so we have the ability to eat early. Slow cooking is really the way to go when trying to have meals ready shortly after I get home from work. My hubby is working even though he is home, so he certainly can’t spend too much time cooking. He can however easily place ingredients into a slow cooker and turn it on. I have created a Pinterest board for slow cooker recipes and my goal is to use the slow cooker more often. I never would have considered making mashed potatoes in a slow cooker until last Thanksgiving. We went to my sister-in-law’s house for dinner and her mother-in-law made mashed potatoes in the slow cooker. They were delicious! I was pleasantly surprised because I was expecting boxed mashed potatoes. My in-laws only make instant mashed potatoes so I wasn’t going to be surprised if my husband’s sister did the same thing! 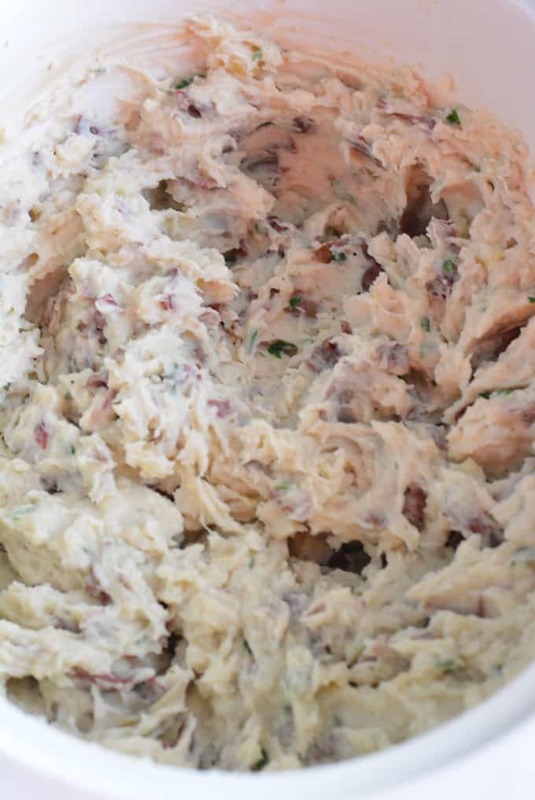 Why make mashed potatoes in a slow cooker? You save space on your stove top, which is especially helpful for the holidays when you may have many different dishes to prepare. The potatoes stay warm in the slow cooker. Mashed potatoes can lose their temperature fast, so by preparing them and storing them in the slow cooker you have the ability to keep them warm during dinner. I love garlic mashed potatoes and twice baked potatoes. I tried to combine elements of both into this recipe from the garlic to the sour cream and chives. My son absolutely loved these mashed potatoes. I can’t say hubby was crazy in love though. He really doesn’t like the skin left on the potatoes, so next week the potatoes will be peeled before cooking. Do you like the skin on or off the potatoes? 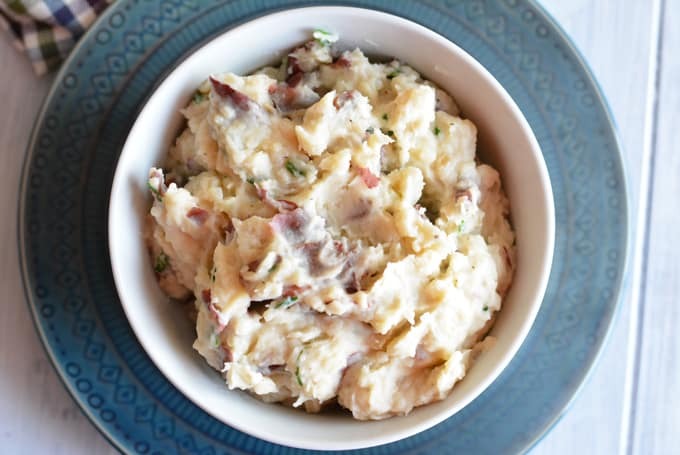 Save room on your stove top by making these mashed potatoes in your slow cooker. 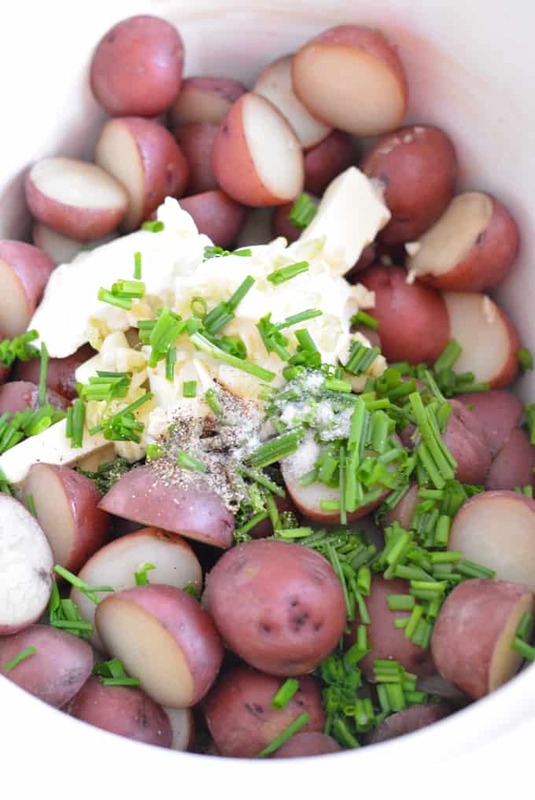 Place potatoes into the slow cooker. When potatoes are cooked through (a fork should insert easily into the potatoes) mash with a potato masher. Place remaining ingredients into the slow cooker. Mix well either with a spoon or hand held electric mixer until well blended. 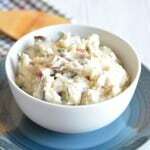 Potato recipes you may enjoy! Yum! Just in time for Thanksgiving! wow, looks like your potatoes came out really nicely in the slow cooker. 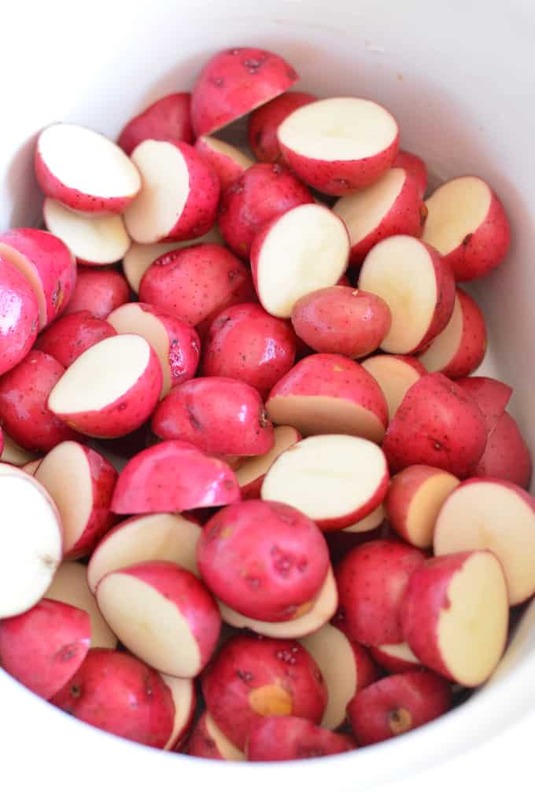 For some reason I tend to like red potatoes with their skins on, but peel other types. Jennifer–I am also obsessed with my slow cooker–but is that such a bad thing when it can produce things as gorgeous and tasty as these potatoes? Can’t wait to try these out! This looks sooo good! I’m thinking about making it for Thanksgiving this week. Thanks for sharing! do you put water in to cook the potatoes for 3 hours? if so, how much? No water is needed. You just grease the inside of the slow cooker. How many people would this recipe feed? The recipe yield 8 servings.